We would like to thank our June judges—Josh and Benny Safdie (Daddy Longlegs), Richard Lorber (Lorber Films), and Jonas Carpignano (winner of our April contest for A Chjàna)—who cleared enough time out of their busy schedules to participate. Next month, we are once again going to open up the floor again to filmmakers of every stripe. As long as your film is under 20 minutes long, it doesn’t matter what it’s about or where it’s from, it is eligible! Go here to submit. But before you do that, let us first announce the June winner and runner-up. Even better than that, we have both films embedded for you to watch this month! Though we’ve only been running this contest for five months, a pattern has begun to emerge in which films with an impressive amount of dramatic power have risen to the top of the pile. That is refreshingly not the case with Laura Terruso’s hilarious Doris & The Intern. Doris (Sally Sockwell) works in a Manhattan office and takes quite a shine to the handsome new intern (Julian Brand). Not only does she not seem to grasp that her fantasy is a pipe dream that will never be realized, Doris doesn’t seem to have a realistic grasp on pretty much anything. (As someone who spent several years temping in various Manhattan offices, this film actually rang more believable and less outlandish to me than it probably should have.) Terruso made this film as a student while in the graduate program at NYU, and while Doris & The Intern isn’t overly ambitious with regards to the scope of its production, when it comes to comedy, that doesn’t matter. The most important thing in a situation like this is timing, and here, Terruso drills it. While the performances are all great, it’s Terruso’s snappy editing that really makes the film pop. And then there’s her soundtrack of choice. While the recurring theme of Biggie Smalls’ “Big Poppa” is funny in the way that it clashes with Doris’s persona, it also feels right somehow. In Doris & The Intern, the bizarre melting pot that is New York City is on full comic display. So which filmmaker from which non-NYC college was able to rise to our challenge and take home this month’s prize? That would be Gus Péwé from Denison University in Granville, Ohio! 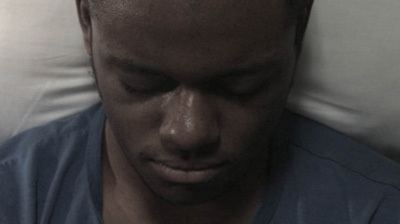 Made while a freshman undergraduate, Péwé’s film is a super-duper example of a class assignment made on a tiny budget that has something many professionally produced films at more widely heralded film schools are often missing: a truly distinct voice. Péwé’s film is as far from a “calling card” as you could possibly encounter—thank God for that—and though that makes it easier to forgive its shortcomings, as the film builds to its stirring conclusion, those shortcomings no longer even feel like shortcomings. Moments after the credits have rolled, This Vacuum Is Too Loud remains there hovering like a weird planet in the nighttime sky. Read the full HTN review.